It’s time to marginalize the university. Universities have come to play an outsize, unwarranted, and often malign role in American life. But their influence and prestige doesn’t stem from any recent intellectual accomplishment or even insidious political agenda. Instead it comes down to “power” to use a word much in vogue among academics. And this power, more than anything else, is economic. Without this power, why would people take academics’ more ridiculous pronouncements so seriously, or seriously at all in the case of communication studies departments? The limitations and drawbacks of North American academia are obvious. This goes beyond the intolerance, irrationality, illiberalism, even violence associated with some “studies” or other departments that see advocacy as their primary mission. Less remarked upon are the catastrophic intellectual failures of the social sciences. This includes the complete inability of foreign policy researchers to forecast the demise of the Soviet Union; the failure of political scientists, with few exceptions, to predict the rise of Trump; and the deeply embarrassing record of macro-economists in terms of warning about the possibility of a financial crisis or even understanding it once it was taking place. There has been no true reckoning following this serial incompetence. The distinctions among these different roles that these faculty members ignore are most cleanly delineated by Clive James in his book Cultural Amnesia. The tension between “café” and “university” continues today, but in a completely different context and with a completely different result: the “café” barely exists. It is no longer financially sustainable. What’s left of it has become entombed in the university. The inflated role of American universities is by design. It is part of an economic and development strategy that is not highly visible, even if the results are. For one, universities are one of the last major American institutions still standing. Traditional media is in a state of collapse. Employers have outsourced and offshored jobs and have themselves been subject to mergers. University towns are some of the few economic bright-spots in an otherwise dark, deindustrialized American landscape. One reason for this continued vitality is that universities are ‘sticky.’ It is very hard to offshore them, unlike a manufacturing plant. They aren’t going anywhere (though they have tried, with various foreign ventures). And there is the case of university endowments, the big ones. These endowments, like their billionaire donors, are the true beneficiaries of economic policies that have favored the ultra rich. A handful of American universities – the important ones – are now very, very rich. The prestige of the university is closely associated with the size of the endowment, which gives some inkling of what is going on here. But universities are intertwined with the US economy in a much more fundamental and less visible way. This interdependence is destructive to the true purpose of the university and ultimately harmful to the economy as well. The new American way of growth is to latch the economy to the university. New products and industries – tech, biotech – are often commercialized spinoffs from universities. Corporations have largely abandoned doing advanced research in-house because Wall Street has declared this should be no more than a hobby. Instead, universities do all the research, increasingly in complex public-private partnerships with industry. This creates obvious stresses on universities, both in terms of finding funding, but also in terms of shaping their ultimate mission. This university-centric system of innovation in America is not working well, even aside from the question of whether or not the university should be a profit seeking entity. Other countries also have close ties between researchers and corporations but this applied research tends to take place in independent institutions such as science parks, rather than inside the university itself. As a result, they seem better able to implement new ideas in terms of actual manufacturing. In contrast, though regional US universities create many new patents, the commercialization, production – and job creation – takes place on the US coasts or mostly abroad. Harvard Management Company, Inc., manages Harvard University’s $37 billion endowment. American academics may proclaim their classrooms as sites of resistance and platforms for social justice, but a broader perspective shows that universities are actually ‘neoliberal’ institutions par excellence. The way to restore the situation to a more normal state of affairs is not to shrink the university, tax endowments, or cut off funding. Instead it is to grow alternatives. The easiest, and most important is to create an apprenticeship system in the US. This could serve as a viable alternative to getting a BA. Not all skills are academic and not all jobs require academic skills. In other advanced countries, such as Switzerland, apprenticeships are widespread, with 70 percent of Swiss teens participating. For instance, the Swiss Group CEO of UBS left school aged 15 and started his career as a banking apprentice. He supplemented this with formal education in advanced management in later years. This fluid system, between apprenticeships and stints of lifelong learning, contrasts with the hierarchical and rigid system in the US where it is a BA or nothing. The US system in turn swells universities with students who don’t necessarily want to be there and who graduate in debt and without career skills. It also limits future career development for most people with only a high school degree or less. The US system leads to empty credentialism while destroying economic mobility. Creating alternatives to BAs would undercut the pressure facing college applicants and their parents. It would also reduce the undeserved power of admission officers. Harvard recently announced it was recruiting for ‘economic diversity’ among other dimensions of diversity, which is nice and everything. But a serious attempt at reducing economic inequality in the US is going to require a lot more than a few tweaks to who gets into Harvard, and any serious person knows this. Ultimately the US requires a revived economy, one with the dynamism the country exhibited from the end of World War II through the 1960s or that China has today. China has been growing at nearly 10 percent a year for 30 years. The Chinese (and German) growth stories are hardly centered on universities. The US can learn from these economic development models, which lead to inclusive growth, and economic mobility without the blessings of a university admissions committee. It is time for a better approach, with the university returning to more of a supporting – rather than domineering – economic and cultural role. Reining in universities’ cultural hegemony has many advantages. Consider: What is the contemporary version of “academic art” (and literature)? What are its concerns, its vision, its impact? Are universities structurally reactionary with a soft spot for illiberal ideas? Put another way, what is it about the university that turns the mildest of people into raging totalitarians? These questions are not merely academic. The only satisfactory answer is to sidestep these issues altogether by restoring the dynamism of civil society, one that has autonomy from academic discourse. A flourishing civil society can do many things. It can make the Café financially viable again, without requiring its participants to resort to university teaching. The Café can provide the empirical grounding and humanism lacking from contemporary academic theory. It’s not enough to marginalize the university: it’s time to revive the Café. David Adler is a graduate of an Ivy League college and lives in rural Connecticut. You’ve lost me; perhaps because I haven’t read Cultural Amnesia. 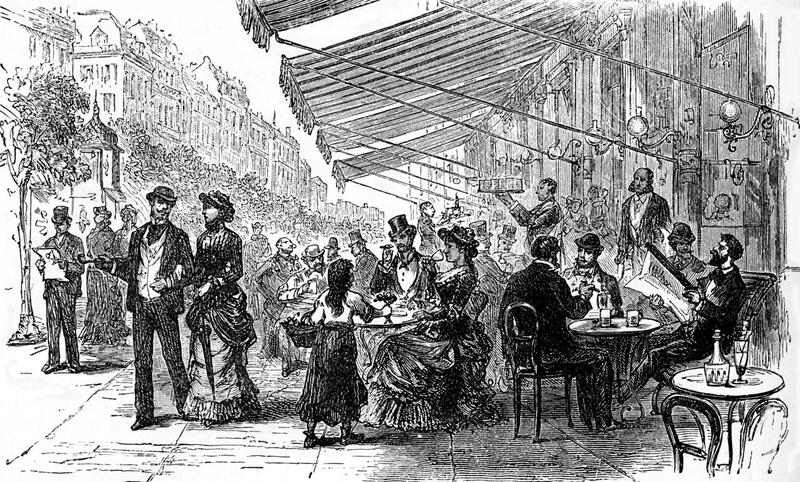 You argue for the re-establishment of the ‘Café’ without defining it. You suggest an apprenticeship program could play an important role but surely you are referring to more than that. You can’t literally mean a café society because that already exists in certain large cities, though perhaps without the nostalgic appeal of the Viennese café society. Agreed, felt like this article ended prematurely. Something needs to change, and soon. Universities seem to exist only for themselves and for the cronies that can benefit — much like today’s government and media in that respect. Corrupt to the core. In Europe and Latin America you go straight to med school after high school; so, not really, BA isn’t irreplaceable. It’s an utter waste of students’ time and money. A BA gets you nowhere in science jobs wise other than a poorly paid lab tech. It’s nit even worthwhile for the humanities. It’s good for two things: grad school and engineering. David, you’re reading ‘Café’ society too literally. I read it as a metaphor of where intellectual ideas could grow from since the universities are intellectually and morally bankrupt. At this point it’s looking like the internet could/is acting as an interim for this, which isn’t a perfect solution but it’s a start. I personally can’t think of any beneficial intellectual movements that have stemmed from Universities. I’m fairly certain that the enlightenment philosophers, while educated, were not chugging keggars on the weekends nor were they tenured professors. Also, the article talks about societal growth from China and Germany that doesn’t have anything to do with their universities, this is true of America’s past as well. I would say our most rapid growth phase happened during the 19th century and had nothing whatsoever to do with education. As a matter of fact the titans from the guilded age were all mostly young apprentices and not formally educated. Great topic, but incomplete analysis. As with other commenters, I don’t quite know what you mean by “Café” in this context. Some of the points made in the article to be less than compelling. Is the American landscape really “dark and deindustrialized” with Universities the only bright spot? Also, the idea that Corporations cooperating with Universities for R&D would seem (on the surface at least) to be a financial boon to academia. You claim otherwise, but you need to argue your point. The examples for eroding institutions of “Traditional Media” and “Employers” (without mentioning Religion – a big miss – and declining faith in political leaders – another big miss) is only half true. Employers are mostly fine. However, I suspect you could have done some interesting analysis on how Corporations are craven when it comes to politics, tending to cave in to demands that emanate from the academic left. The biggest miss here, and one that remains completely unexplored, is the changes occurring the academia today. What will happen with online learning? Are US Universities going to fall behind global peers? The whole landscape is ripe for change, so how does your idea about Cafes fit in with that? I’m guessing that cafes might be referring to the penny universities (cafes) of old, something I’d love to see again. If the system won’t educate effectively, establish another framework to educate our next generation. I have a long history in management of large projects, backed by a degree in management. I recently wanted to study another domain at university and was asked to sit a test by ACARA to assess my university entrance rank. The test surprised me at how obscure it was. Logical analysis was worthless in this test. It helped me appreciate how misguided academia has become in Australia, especially with respect to meaningful skills for industry – I wouldn’t want to hire somebody based on these tests! This experience, compounded with the damning report by the Institute of Public Affairs about identity politics across all Australian Universities shows how ineffective universities have become across Australia (and I suspect the western English speaking world). As is often the case when I read about higher education, this article demonstrates a lack of understanding about the variety of colleges and universities out there. In other words, they’re not all Harvard and Yale. Community colleges, small liberal arts colleges, technical institutes, colleges of art and design (where I teach) all provide significant benefits. It’s absolutely true that, in general, the higher education system has become too expensive and often without enough return for students. But I have students who are working freelance when they’re sophomores and interning for Pixar when they’re seniors. You write, “What is the contemporary version of ‘academic art’ (and literature)? What are its concerns, its vision, its impact?” I suggest you pick up a copy of Artforum or the New York Review of Books or, you know, look around the internet. That’s what your college education at an Ivy League institution was supposed to have taught you: intellectual curiosity and the ability to research. FWIW, we have a cafe (a bar) down the street from campus, and when the weather’s nice, we sit out there and drink and smoke and talk about defeating neoliberalism, and then we go teach, publish (not just in academic journals), and engage with other “scholars” locally and nationally. I’m not sure what you think we’re all doing in those so-called ivory towers. I think those community colleges, technical institutes, etc more closely resemble the apprenticeship model the author advocates for vs “traditional” (or whatever you want to call them) universities like Ivy Leagues or even state flagship universities. This was a great article to spur conversation. I would love to see to idea further expounded upon. In a nutshell, college isn’t for everyone, but skills development, training, and education are. America really needs to invest in its community colleges and trade schools which often are excellent feeders to local jobs such as HVAC specialists, electricians, beauticians, and more. As an engineering major who cooped, I was always fascinated with Germany’s apprenticeship model, too. I always thought it weird that a company would hire me as an engineering intern without having taken any engineering classes. Even with an engineering degree, many firms often provide even more rigorous training to new hires. I’m surprised more companies haven’t created their own schools yet to teach and train entry level employees after high school.